Greetings! Welcome to another Great Escapes Virtual Book Tour. 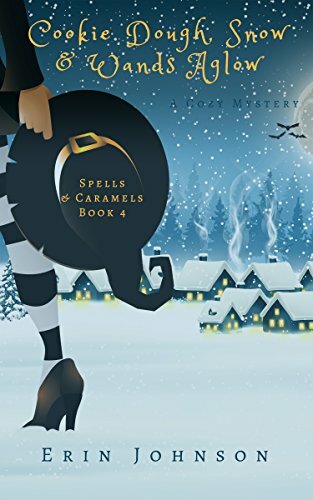 Today I’m thrilled to be hosting a stop for Cookie Dough, Snow, and Wands Aglow, the fourth book in the Spells & Caramels series by Erin Johnson! This is one of my favorite cozy mystery series and as my quote on the banner says, I’m absolutely enamored with this series! Murder in a magical, merry town just brimming with secrets. On the snowy road to the Earth Kingdom for the holidays, Imogen and the bakers are ambushed by Horace, villainous leader of the Badlands Army. They’re forced to detour to an idyllic, rural village, bedecked in lights, garlands and winter cheer…all a little too perfect to believe. At least that’s so for Imogen, who’s seeing burned out buildings and mysterious memorials that no one else seems to notice. Hank’s royal presence gets them invited to the big bash at the governor’s mansion. The night is filled with dancing, stolen kisses under the mistletoe and fun, until a guest is found dead in the cauldron of punch. As bodies and mysteries pile up, all the evidence points to the vampire Francis as the culprit. The gang must come together to clear their friend’s name and save themselves from the angry villagers. Even worse, Imogen struggles with having to keep her relationship with Hank hidden, while working with him to find the real killer. As Imogen unearths more than a few town secrets, she finally solves the riddles of her past and discovers the truth of Horace’s pursuit of her. But will all the secrets be unraveled in time to stop the killer, or will Imogen and her friends suffer a monstrous fate? I love this series so much! This latest installment in the series does not disappoint at all. We find our characters on a special trip for Bruma, a holiday to celebrate the Winter Solstice. They get detoured to this little town and as usual, a murder occurs and the investigative spirits of the team are needed to help solve the mystery! These characters are very well-rounded and complex. They’re realistic (aside from the magic part 😉 ), wonderful, and just a joy to read. I enjoy learning more and more about them as we get further into the series. The characters just draw you in and make you believe that you’re friends with them all. And let me tell you, I don’t normally do vampires, but I love Francis, so that’s really saying something! This particular book found us learning something important truths. I did NOT see the plot twist coming at all. It makes things make a lot of sense, but I still wasn’t expecting it. The way that we find these things out is perfect. I did figure out the villain before the reveal, though I hadn’t figured out how she had done it exactly, so that part was still a surprise when it was revealed. All in all this is an excellent 4th installment in the series and I’m looking forward to the 5th book! If you wish to read the series, I highly, HIGHLY recommend you start at the beginning with Seashells, Spells, & Caramels. While each mystery in the series is it’s own separate story, you need the backstory on the personal relationships and other things that are happening throughout the whole series in order to understand why the plot twist was so astounding. Thanks for joining me today! If you wish to visit more spots on the tour, please click on the banner below to be transported to the main tour page where you can find a list of all tour participants! Welcome! 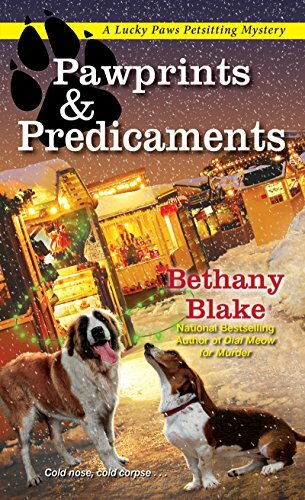 Today, I’m hosting a stop on the Great Escapes Virtual Book Tour for Pawprints and Predicaments, the third in the Lucky Paws Petsitting mystery series by Bethany Blake! I really enjoyed this book, just as I have the two previous books in the series. 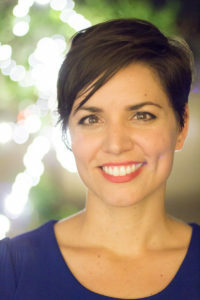 Underneath the review is an interview with the author, Bethany Blake. I’ve really enjoyed all three books in this series! Daphne is a wonderful, quirky character who has a fairly decent head on her shoulders. Sometimes she runs a little too impulsive for me, but most of the time she at least thinks about the danger before doing something. I also really love Jonathan Black as a character. We get to learn a little more about him in each book and I love that! It’s exactly how a series should be in my mind. The plot this time around was very intriguing to me. I really had no idea who the villain was before it was revealed. The subplots were all great as well. The story was very well-written and I highly recommend it! Ms. Blake’s Answer: I do have a second job being… a writer! I work for Bucknell University, a small liberal arts college, in the Division of Communications. It’s pretty fun. I write stories and get a lot of free food. Ms. Blake’s Answer: I try to write every day, and I set page or chapter goals. I like to have music in the background. My Spotify playlist is huge and varied. Ms. Blake’s Answer: Oh, my characters always hijack my stories! I don’t outline. I feel as if things always come up that lead me in new directions. Ms. Blake’s Answer: I was fortunate to have a mentor who suggested that I join Romance Writers of America, and I found my agent there. I wrote a few manuscripts that I submitted to various places on my own, and those were rejected. Once I had an agent, I sold my first book pretty quickly. But, like every author, I have endured a lot of rejections since then. When I get a rejection, I give myself 24 hours to sulk and consider quitting. Then I pick myself back up and move forward. Ms. Blake’s Answer: I usually have two or three revisions. I don’t have beta readers. Just my editors. And there’s always a period between the time I submit to my editor and the time I get revisions that I just set the manuscript aside. It’s good to take a break and see things with fresh eyes later. Ms. Blake’s Answer: In my first book, Jessica’s Guide to Dating on the Dark Side, the villain—a vampire prince—was also the hero. I tend to view characters as complex and nuanced, so it’s not hard for me channel the darker aspects of my personality. And there’s no real inspiration for the villain in my upcoming book, Pawprints & Predicaments. But I can’t say more for fear of giving something away! Ms. Blake’s Answer: There are aspects of me and my sister in the characters of Daphne and Piper Templeton. Like pet sitter Daphne, I’m an animal-loving, world-traveling, poor-at-bookkeeping bumbler, while, like veterinarian Piper, my sister is rational, organized and a medical professional. Ms. Blake’s Answer: I would write about my father, Donald Fantaskey. He was one of life’s great unsung heroes. Whether quietly fighting racism in the 1970s, leading by example, or making everyone around him laugh, he always made the world a better place. Ms. Blake’s Answer: I have been revisiting some classic cozies by Martha Grimes. Whenever I need inspiration, I turn back to her books. Ms. Blake’s Answer: Everything by Dickens, Austen and Dumas. I was an English major, way back when, and those books paved the way for my future writing career. Ms. Blake’s Answer: I would hang out with my amateur sleuth, Daphne. We’d start off with a big breakfast at the Silver Moon diner, then pick up her best friend, Moxie Bloom, and go shopping for vintage clothes. Next, we’d eat lunch at Casita Burrito and walk Daphne’s various fosters and clients. We’d round out the day with dinner at Franco’s, where only Moxie would admit to having a huge crush on Detective Jonathan Black. Ms. Blake’s Answer: I don’t read reviews anymore unless my editor shares them with me. And I never respond. I don’t change my work to reflect reviews, either. There’s no way you’ll ever please everyone. I will say that the negative reviews I’ve received—and everyone gets some—have made me a more compassionate person. When I dislike a book or movie, I’m keenly aware that someone poured their heart into the project. I would never trash something that another person created. We should all be here to lift one another up! Thank you to Ms. Blake for being willing to answer my questions! Thank you for joining me today! If you wish to visit more stops on the tour, please click on the banner below which will take you to the main tour page! I know I haven’t posted a lot lately, and I’m sorry for that. Life has been… well, life. Here’s what’s been going on in the last month or so. I took some vacation time over the holidays. I’m usually not online much during my vacation, whether I go away or stay home. I might flip through Facebook once a day on my phone, but that’s about it. My best friend was supposed to come for New Year’s but car problems prevented that from happening. I spent the time working on what is seemingly the never-ending room project. For those of you who are newer to my blog, I’ve been working on deep cleaning/throwing stuff out/donating stuff/decluttering/reorganizing my room for months now. To say it’s never-ending is a bit of a misnomer, I know, because I really am so close to the end. I’m down to two tubs and a pile to get thru plus a few other things that need to get put away. It’s really not much. However, since I’ve been working on this since JUNE (on the weekends mostly), it seems like it’s never-ending! My mom keeps reminding me tho’ that it took me 2+ years to get it to the level of disaster that it was so, 7 1/2 months really isn’t bad since I can only work on it on the weekends and sometimes that just doesn’t happen due to mental health, physical health or prior plans. On top of the seemingly never-ending room project, things have been quite crazy at work. Over New Year’s weekend, we migrated to a new software system for our library. If you’ve ever migrated to a completely different software system at work, you know it’s not precisely easy. Nor does it usually go off without a few hitches. We had to switch. Our old software was being discontinued by the manufactured. However, our new software is drastically different from the old and it’s really taking some getting used to. Not only do I have to figure out cataloging of regular items to do my main job in acquisitions, but I also have to figure out the cataloging of Inter-library Loan items since I’m a part of the ILL team and the only ILL team member with cataloging knowledge. It’s been challenging to say the least and by the time I come home at night, I’m pretty dead tired. I was also sick the week that I went back to work, so that didn’t help my trying to get used to the new software. I had no patience for things that didn’t work like I wanted them to! Hopefully the warmer weather will help me get back to feeling more human and less like a popsicle. I have reviews I want to write, I just haven’t had the momentum/energy to do them recently. Thanks for hanging in there with me!